I submitted my previous post, Why Working at Google Is Not My Dream Job (Anymore), to HackerNews and it hit the front page! Within the first hour of its submission my post reached the front page, and then quickly peaked at number ten. It floated between the number ten and twelve spots for another three hours, but after six hours it had dropped to the second page. By the time I got home from work, it had fallen to the fourth or fifth page and had accumulated 196 points and 166 comments. You can tell I am a little bit excited about all this. I think in one day I had the same number of views that I have had in the last three years. Here's a link to the HN comments. I probably should have picked a different title. It served well to grab the attention of readers on HN, but it doesn't serve as well to summarize the contents of the post. Lots of people had similar experiences with Google and other large companies. This is not surprising. Lots of people had quite the opposite experience interviewing at Google. This is also not surprising. There were some pretty rude/crass comments made. This should be expected with the internet. At peak bandwidth, my server was struggling a little bit. Pages were definitely loading a little slower. Someone took the opportunity to explore other posts and comment on a six year old post. So apparently the combination of my latest WordPress theme (Lightword) and Google's code syntax highlighter for Python, makes IE8 go insane. The syntax highlighter for C/C++ seems to work fine with IE8, but when IE8 tries to render a page thats displaying Python code, the browser hits some sort of null array error. The worst part, is that instead of handling the problem gracefully, IE8 doesn't display ANY of my Python code. I'm currently displaying Python code on my site without syntax highlighting, and am trying to find a solution to this idiotic problem. I've always tried to keep some seperation between my internet and physical presence, especially when it comes to this blog. I don't want my roommates knowing that I write unflattering articles about them on my website, and nor do I want some random dude that lives in the middle of Montana (i.e. nowhere) knowing everything about my day to day life ('cause thats just kinda creapy). Most personal blogs have a little "about the author" section, or something that describes the writer and their personality. But because of my desire to seperate my internet and physical self, I've never really written one, until now. So here's a suitably vague description of me. 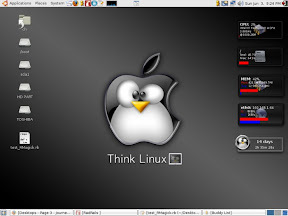 I like computers, and reading, and mucking about with Linux. I tend to go through phases where I get obsessive about one single thing. Right now, its bikes, before it was watching old reruns of Buffy the Vampire Slayer. I often have trouble concentrating on anything; when I'm in class I'm thinking about fixing my bike, and when I'm watching TV with my roommate I'm thinking about my math homework. I have an extremely active imagination and am capable of keeping myself amused for hours on end without moving an inch. I often wish I were smarter. I've been unexplainably remiss in my blogging duties lately, and there really hasn't been any other reason for my lack of blogging besides the fact that I'm extremely lazy. I'll be leaving for school tomorrow, so I'll soon be blogging with even worse regularilty. Hopefully, I'll be able to finish up one or two of the drafts in my archives before I leave, so that my blog doesn't look as though its been deserted. That's about I have to say for now. Yes, I know, I've been seriously slacking on writing the past week. I've been writing quite a bit tonight, these past few hours, but I want to spend some time to edit them before I publish them, so I won't have anything new till tomorrow morning. Sorry to all you people eagerly awaiting the next chapter in the exciting saga of my HP dv2910us review. Remeber folks, patience is a virtue! Oh! And BTW, I re-found that stupid snake that I ran over with my bike. Here to read more on that. So unless you've spent the last few years never clicking on an image on a web page, you're quite familiar with Lightbox-like effects (and if not with the name then at least with the effect itself). Here's an example of Lightbox2 for those unfamiliar with it. When I say "Lightbox-like," I am referring to any kind of "effect" that allows for embedded pop-ups of images and other forms of media (i.e. flash videos, etc). The benefit of Lightbox, aside from the aesthetics, is that it doesn't result in an actual pop-up (which are often blocked by a pop-up blocker on a modern browser), or require the user to navigate to another page and then hit the browser's "back" button to navigate back to the main content. The basic idea is that Lightbox makes a visitor's life easier, supposedly. I'm currently hosting my site with railsplayground, who provide a fairly decent hosting plan for just 5 US dollars per month. Up until the this year, server uptime with railsplayground seemed to quite good. But this year, especially in the past month or so, uptime has been pretty flaky. Today, the server my site is hosted on was down for well over twelve hours, and my site just can back online an hour ago. Hopefully, this is just some weird funky thing going on with my server and this won't be a problem again. I really do like railsplayground and I don't look foward to having to seek out another hosting service and move all my crap over, but if problems continue I may very well have to.